Regardless of where you work, injuries are possible. Certain work environments, such as construction sites or warehouses, have obvious risks; heavy machinery and large boxes put a strain on your body and place you at risk for long-term injury. There are less obvious work environments that also offer risks, which include those including and like office jobs. Arthritis and long-term eye problems are becoming more common as computers become a reality of the modern workplace. If yours or a loved one’s career has led to long-term health consequences, you may want to consider long-term disability insurance. Long-term disability insurance is an insurance policy that protects you from financial harm in the event of an injury that puts you out of work for an extended period. The professional personal injury attorneys at Hankey Law Office have decades of combined experience fighting for you after a workplace injury. While we are fighting for your just compensation, long-term disability insurance can provide income to stave off the financial pressure following an accident. Here are three reasons that long-term disability insurance may be for you. 1: Worker’s compensation is frequently the subject of legal battles. Oftentimes your employer will contest your disability rating or their liability in the accident or hazard. Although long-term disability insurance and worker’s compensation cannot be collected at the same time, insurance can cover the gaps. While fighting to recover maximum recompense, hospital bills can pile up and place an undue burden on you and your family. Long-term disability insurance can lighten the load when a trained attorney fights on your behalf. 2: Long-term disability insurance specifically covers lost income. While worker’s compensation may cover hospital bills and emotional damage from the accident or hazard, it may not cover lost wages going forward. 3: Pre-retirement age injuries are more common than you may think. According to the Social Security Administration, more than one in four of today’s 20 year-olds will become disabled before reaching retirement age. When you are starting a family and buying a home, the last thing you want is to lose your income. An accident resulting in long-term disability is tragic, but recovery is possible. 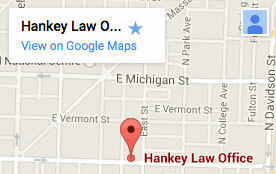 Allow the skilled long-term disability lawyers at Hankey Law Office to fight for you. Contact us today at (800) 520-3633 for a free consultation.